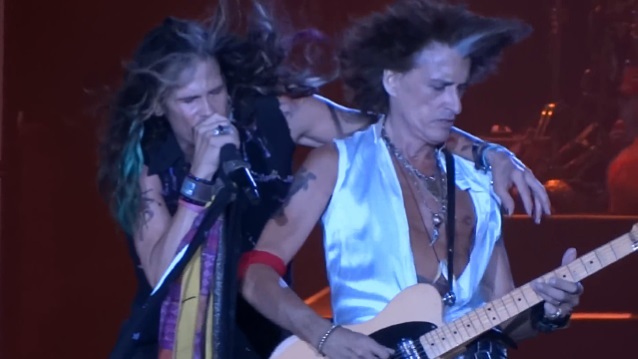 Steven Tyler and Joe Perry of AEROSMITH have contributed music to the original score of "The SpongeBob Musical", which will have its premiere in Chicago next summer. It will begin performances on Tuesday, June 7, 2016 at Broadway in Chicago's Oriental Theatre (24 West Randolph Street, Chicago, IL). This is a limited engagement through Sunday, July 3, 2016. "The SpongeBob Musical" is co-conceived and directed by Tina Landau with a book by Kyle Jarrow, music supervision by Tom Kitt. "The SpongeBob Musical" will be a one-of-a-kind musical event with additional original songs by Jonathan Coulton, DIRTY PROJECTORS, THE FLAMING LIPS, John Legend, LADY ANTEBELLUM, Cyndi Lauper, PANIC! AT THE DISCO, PLAIN WHITE T'S, THEY MIGHT BE GIANTS and T.I., with an additional song by David Bowie and additional lyrics by Jonathan Coulton. The design team includes scenic and costume design by David Zinn, lighting design by Kevin Adams, projection design by Peter Nigriniand sound design by Walter Trarbach. "The SpongeBob Musical" is a rousing tale of a simple sea sponge who faces the unfathomable. It's a celebration of unbridled hope, unexpected heroes, and pure theatrical invention. "The SpongeBob Musical" will be produced by Nickelodeon. "I was drawn to this project not only for its wild theatrical possibility, but also because I felt SpongeBob, at its core, is a layered and hilarious ensemble comedy," said Landau. "SpongeBob himself is of course its center and beating heart — the eternal innocent in a sea of cynics. He's also the classic underdog hero, and so our production sets him on a hero's journey with real stakes, all the while retaining the show's trippy humor and irreverence. We're taking our leads from the TV show but this is an original story, with an original design approach, and original songs written just for the occasion by an amazing array of songwriters. We will present the world of Bikini Bottom and its characters in a whole new way that can only be achieved in the live medium of the theatre. We're bringing the show's fabled characters to life through actors-not prosthetics or costumes that hide them-and we're deploying some unconventional stage craft that will prove that anything can happen in Bikini Bottom." "SpongeBob long ago transcended the TV screen to become a pop culture icon inspiring everyone from kids and families to artists and musicians, pro athletes, movie stars, fashion designers, social media mavens and even the President," said Cyma Zarghami, president, Viacom Kids And Family Group. "This character has achieved a level of global popularity that we could never have imagined, and bringing him to Broadway is a way to give him a new platform, literally, to reach audiences of all ages who are looking for an engaging, funny and innovative musical theatre experience." Added Russell Hicks, Nickelodeon's president of content development and production, "We decided early on that we would only bring SpongeBob to Broadway if we could find someone with a wholly unique take on these beloved characters. When we met Tina, we immediately understood that her vision would not only live up to the expectations of both fans and new audiences, but also to the high level of artistry and professionalism that are the hallmarks of Broadway. The innovation she is bringing to the staging is matched with an equally fun and surprising set of original songs we've culled from a dream team of SpongeBob fans who happen to be top-flight musical artists, like David Bowie, John Legend, Cyndi Lauper, LADY ANTEBELLUM and T.I." Since premiering on Nickelodeon in July 1999, "SpongeBob SquarePants" has emerged as a pop culture phenomenon. The series has been the most-watched animated program with kids for more than 13 consecutive years, and over the past several years, it has averaged more than 1 million total viewers every quarter across all Nickelodeon networks. As the most widely distributed property in Viacom history, SpongeBob is seen in over 185 countries and translated in more than 50 languages. The Paramount Pictures feature film "The SpongeBob Movie: Sponge Out of Water" premiered Feb. 6, 2015, landing at #1 opening weekend and going on to be a major hit globally. The character-driven cartoon chronicles the nautical and sometimes nonsensical adventures of SpongeBob, an incurably optimist and earnest sea sponge, and his undersea friends.